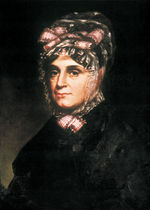 President-elect Harrison asked his daughter-in-law Jane Irwin Harrison widow of his namesake son to accompany him and act as hostess until Anna's proposed arrival in May. On April 4 exactly one month after his inauguration President Harrison died. While visiting relatives in Lexington Kentucky in the spring of 1795 Anna Harrison met Lieutenant William Henry Harrison in town on military business.